Stephen King’s 1982 novel and subsequent movie, both titled “Christine,” were about a 1959 Plymouth Sport Fury with a mind of its own. Editor’s note: This is the 27th in a 30-day series featuring cars from the Ron Pratte Collection that will be sold this month at Barrett-Jackson’s Scottsdale auction. Stephen King’s 1982 novel and subsequent movie, both titled “Christine,” were about a 1959 Plymouth Sport Fury with a mind of its own. Approximately 20 ’58 Plymouths were used to make the film, but most were cheaper Belvederes and Savoys that were passed as Furys. The majority of these cars were completely destroyed, discarded or otherwise disposed of to eliminate the studio’s liability. But one pristine “Christine” lived through. Thanks to a large-scale promotion including over 40,000 entries, one lucky fan, Scott Edminster, took home the fully restored 1958 Plymouth Sport Fury featured in the movie. 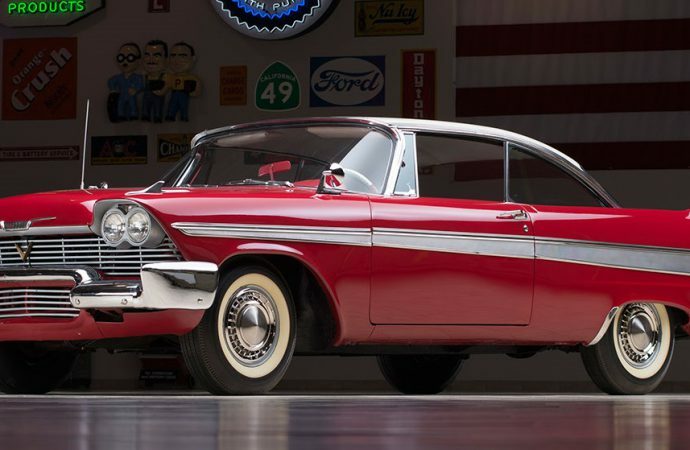 This 1958 Plymouth Fury “Christine” (Lot #2006) is still in perfect running order and contains a substantial paper trail to support its exclusivity. This piece of Hollywood history is scheduled to cross the auction block in Scottsdale on Tuesday, January 13.